Rain gutters are troughs typically located around the perimeter of a roof that discharge water from the building. The purpose of them is to keep water from channeling along the foundation of the house and off the walls – both of which can damage the structure over a long enough period of time. Occasionally called an eavestrough, rain gutters work best on a pitched roof – but flat roofs too are required by federal building codes to have at least a slight inclination. The most common material that gutters are made out of by far is aluminum – this metal is lightweight, easy to install and rust proof. This aluminum can come in different thicknesses – with .022” the most common, and hardier ones going as high as .032”. Some people attach rain barrels and cisterns to the downspouts of gutters in an attempt to recycle some of the water. Screens and hoods can also be installed to block out any debris from building up. 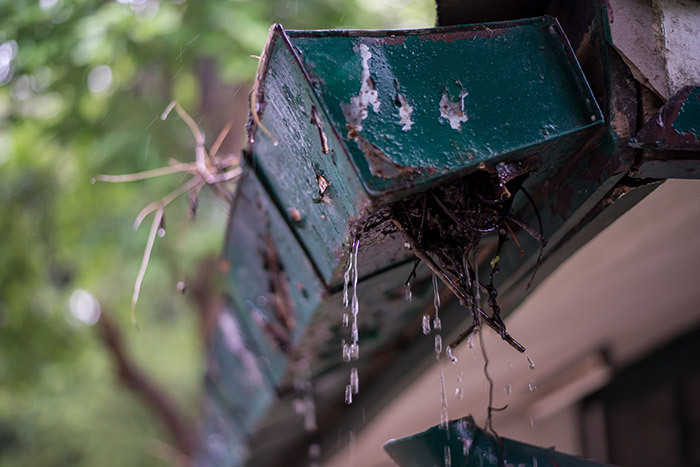 If you’re unfamiliar with gutters, it may come as a surprise that there are actually different types – with the two most common being sectional and seamless. The fomer of these two is installed exactly like the name suggests – in a series of sections. Seamless gutters, on the other hand, are made of a single piece, not having any weak points in its construction. While not perfect, seamless gutters are by far the superior option when it comes to a new gutter installation. While seamless gutters are better, sectional gutters do have a couple small points in their favor. Since they come in multiple pieces, sectional gutters are cheaper and easier to install – though the difference in price isn’t nearly as large as it used to be. This affordability comes at the cost of overall design though. Each area or joint that a sectional gutter attaches to is a potential point of failure – dramatically increasing the risk of erosion or blowout caused by rainwater build up. A seamless gutter portion is one piece, meaning that the same level of durability can be found throughout. Sectional gutters have a tendency to clog much more – this is a result of small pieces getting attached to the cracks in even the tightest joint crevice. Lacking any joints, many times this type of gutter can be referred to as sheet metal or soldered gutters. When purchasing these soldered gutters make sure you have all of your measurements in order – they’re made as one piece, and thus require to be built to order. While this means you’ll have to wait for them to be delivered, it does allow more customization. Not only is this in the design – as in where the downspouts are going to be located – but also in aesthetics. Seamless gutters can come in a wide variety of colors, with some manufacturers offering over 60 choices! Sometimes you can also pick a different material than the typical aluminum construction, with other popular choices being stainless steel and vinyl. Thanks to these numerous advantages, you can also expect an increase in value of your home with seamless gutters installed. If you’re thinking about installing a seamless gutter system, you first are going to have to remove any pre-existing gutters if you have any. Take a walk around the house or building and see how they’re attached to the roof. Take particular notice of joints, corners, and downspouts. Also take a look if the gutters were put together with screws or rivets. From here, you need to grab the appropriate tools – a screwdriver, drill, ladder, snips and a pry bar. When disassembling, start with the downspout first by removing the elbow that’s connected to the outlet. From here, you’re going to want to remove the strap that holds it to the siding – be extra careful as you don’t want to damage any fascia. When removing the gutters themselves, you might need to manipulate it so you can get to the screws or rivets – use a pry bar to bend it in a way so your screwdriver or drill can reach them. After you remove them, you might want to take this opportunity to fill in any holes and find any rotten wood spots to replace. Wood putty works great for filling in small cracks or holes in fascia. It’s also recommended to repaint these parts as an extra level of protection. The gutter itself should be recycled at your local recycling center. This isn’t only great for the environment, but also allows you to recoup some of the cost. Before installation can start, you’re going to need a cordless drill, crimper, hacksaw and extension ladder. If you haven’t already, make sure you have fixed any busted fascia and soffit. Rotten wood can undermine even seamless gutters as they’re now a weak point. Ideally, you’re going to want to attach your gutter at set lengths – screwing the gutter to the fascia every 18” or 24”, and 6” away from any corner. If you don’t have any fascia to attach the gutter too, there are roof hanger mounting straps available for purchase. Downspouts should be located in unobstructed areas pointed away from the house, while the gutters themselves need to be at a slight slope – especially if they are 40 feet or more. As a general rule of thumb you should have a ½” decline for every 10 feet. If in doubt, you can test the gutter by pouring a large amount of water and watching if it goes toward the downspout or not. For extra protection think about investing into guards and screens to repel tree debris. Rain gutters are simple system that can keep water off of the walls and foundation of any home – reducing the risk of leaks and mold. Usually found in aluminum, gutters are also available in stainless steel and vinyl. The most common types of rain gutter are sectional ones – these mass produced variants lack much of the aesthetic appeal as seamless, along with having multiple defects as a result of their design. Seamless gutters are more durable, less prone to leaks and come in a wide variety of colors to fit the color scheme of your house or building. When removing old ones and installing new gutters, remember to always put safety first by wearing gloves and safety goggles. In order to ensure the longest life and to maximize its efficiency, make sure to clean out your gutters twice a year. When you’re in the market for a seamless gutter system, you’re going to need the proper measurements as they need to be custom made. If you don’t feel comfortable with measurement, removal and installation, there are plenty of installers in your area that can get the job done for a reasonable price. Don’t be afraid to compare and look to see if they legally certified by the state as a contractor. 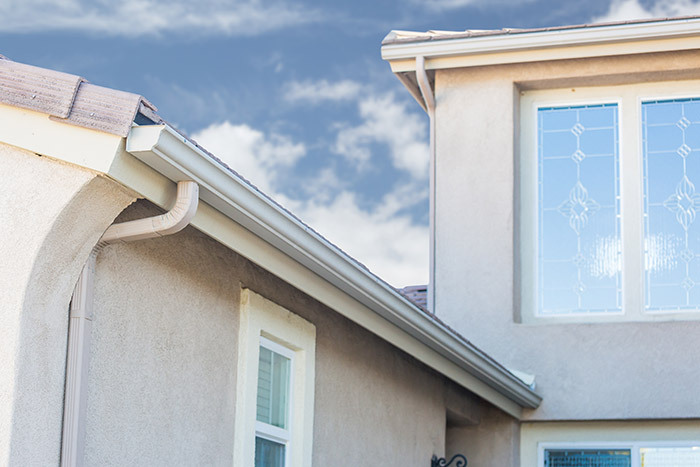 Homeowners look to Feldco for the best seamless gutters in Peoria. We make sure to custom make your gutters to the exact measurements to make a clean and secure fit on your home. Start your gutter replacement today with a free quote from Peoria’s best.